Listed by year of release. 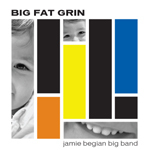 The second CD from award-winning composer Jamie Begian's big band, a creative forward-thinking group that I've played in since its inception. I play alto sax and clarinet, with a solo on the opening track Funky Coffee. My first CD as a leader features eight of my compositions plus three arrangements of standards. The guys in the band played great and the reviews were very gratifying. I recorded this live date with cabaret singer Quinn Lemley in Athens in late 2001. Quinn's 1940s-Hollywood glamour and effervescent personality were a big hit with the Greek audiences both during this run and when we returned in 2003, 2006, and 2010. The debut CD from Jamie's big band features eight of his compositions and I'm lucky enough to get a nice long solo on MarcySong. This CD consists of demos that the Rollins Band recorded in 1992 for the record that eventually became The End of Silence. I played a few shows with them in late 1991, so they had me come in to the studio and blow on one tune (Almost Real). My contribution to this CD consists of a grand total of 10 notes, overdubbed three times. It was a fun recording session, though, and it's a great record, so I'm happy to be associated with it in even a small way. Quinn's swing band record with an eight-piece "little big band." The first CD I recorded with Quinn, a collection of standards mixed with originals by her long-time musical director, Bob McDowell. The debut album (yes, vinyl!) from Central Jersey's finest fusion band of the Eighties (my brother Sim Cain on drums, Wilbo Wright on bass, Jack McCracken on guitar, and me). We intended the name to be tongue in cheek, but sadly most people took it at face value.